So as you may or may not know, I have reached 200 followers on my little blog and I am over the moon about it (I was in my room on my own when I noticed and literally did a :O face at the computer screen)! First off, I just want to say thank you. Thank you to every single person who pressed the follow button. Every new follower puts a smile on my face with out fail, so thank you all for putting 200 smiles on my face in the past few months! I know 200 isn't a huge number compared to some blogs out there, but I did have a moment of realisation that if I got 200 people to stand in one room and thought that each one have chosen to follow me, that there would be a pretty large number of people, so that's made me one very happy lady! So anyway, now the soppy bit is over! ;) Giveaway time!! As I said I was going to do a giveaway when I reached 100 followers and didn't due to many reasons, I thought I'd make up for it in this one and give away a few extra pieces to one lucky person! See below to see what you'll win and how you can win it! Lovely set of prizes! Congratulations. Such a lovely giveaway! :) I love seeing your outfit posts! I have been looking through your blog this evening and I love it :) Congratulations on reaching 200 followers and I am your newest :) To me that seems like a vast amount because I only have just over 40! Your style is lovely and you are really beautiful and I love the fact that you enjoy a good bargain like me! I like beauty related posts and tips for affordable prize cosmetics. Congrats on reaching 200 followers! You have a great blog, so I'm sure you'll get hundreds and hundreds more. my favourite type of posts are your outfit posts, although tbh I really enjoy reading your blog in general -- your haul posts are also great. Love all of your posts! That bag is gorgeous! Thanks. Congrats on your milestone!! And thank you for the lovely give away!! I'm a new follower (not sure how I haven't found you before though!) but I really like your outfit posts and hauls. 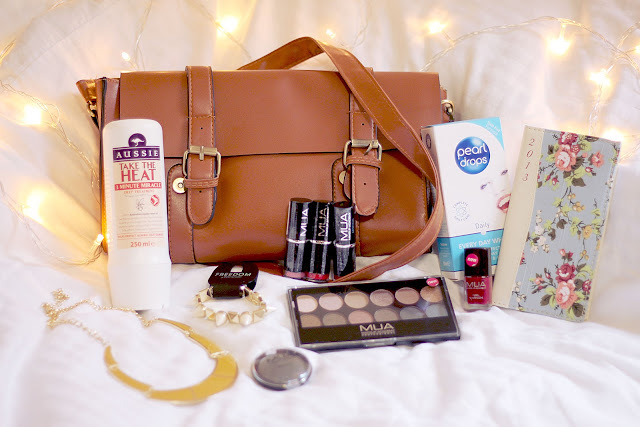 hauls i love your hauls! congrates on the follows! wow congrats! Fave posts are reviews and skincare routines! Love finding new products and what works for people! I love reviews and nail polish posts! Thank you for this giveaway! You picked some awesome prices! I like your hauls and snapshots are awesome as well. Not going to lie, I only found this blog from looking for bloggers giveaways... However, I'm so happy I did! You write about all the things I'm into and have such a great, easy-to-read writing style. my favourite posts are the DIY ones, I love new projects! I love your nail art! I love hauls and reviews! Thank you so much for commenting! I love reading all your comments which is why I chose to use comment moderation meaning I see and read every single one! Thank you for visiting Bambella Blog!